BlogHome » Blog » Getting….so………..close!!! I've struggled with a lot of different issues throughout this fabrication process, and currently I look back on the naivete that led me to embark on this project with a fair degree of resigned amusement. I love what we have done, I love the way it is coming together, I love the challenges that we have overcome. 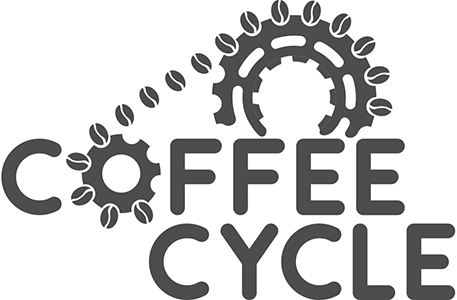 But I am damned ready to have a functional Coffee Cycle to show for it. Fortunately, that day is not far off. 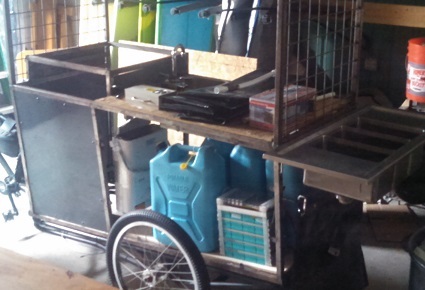 The last blog update detailed the satisfaction of having successfully completed a mobile tricycle platform that was capable of carrying and moving the significant weight of a completed mobile cafe. However successful we felt, I did end up going back and calling in yet another welder (this one specializing in automobile-specific custom welding/repair) to reinforce yet again the center of the tricycle's "tongue" (the midpoint between the front and rear axles, where the weight sits most dangerously). After that, it has been back to focusing on the mobile cafe, and there has definitely been significant progress. The frame of the mobile cafe had all its welds finalized, had a roof/canopy structure added, and I had started sanding and grinding away any burrs/sharpish places along the metal created in the fabrication process. We made a few trips up to Industrial Metal Supply before picking out and buying a large sheet of welded steel mesh, with holes about 2 inches wide, to cover the openings along the front and back of the cafe. We used some more of the sheet to cover the canopy, figuring it would be easy to mount solar panels onto, and even perhaps trellis a vine or two along to create a living ceiling. 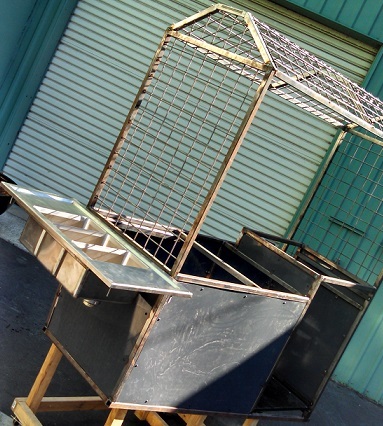 It came out exactly as we wanted, but did give the project the appearance of a shark cage on the back of a tricycle. After the mesh was up, we started playing Tetris with the interior pieces: the freshwater tanks, the battery, and the plumbing. We had originally planned to have the rear-mounted three-compartment sink be detachable/deployable, but, after considering pros and cons, we decided we could easily leave it in the deployed position during transport and operation without any inconvenience. This simplified a few plumbing issues, including the gravity-based drainage into the collapsible greywater tanks, which now mount directly below the sink. Peter figured out some crazy plumbing adapter gizmos to get from the three-compartment into the greywater tanks, and I spent the next week making trips to the hardware store trying to replicate what he had done just for the handwashing sink and espresso machine. Having done all the plumbing as was practical before getting the last plumbed-in piece (espresso machine - it should be ready to bring to the fabrication shop by the end of the week! ), Peter started working on the electrical and I put some time into finishing the flooring and mounting the clever clips/straps Peter figured out to hold the freshwater tanks and battery securely down. Next up: we work on the countertop, install the espresso machine, finalize the required drawings for the Health Department, then paint! Within a few weeks from painting, the Coffee-Cycle should be ready to go (those few weeks being the time the Health dept. requires to go through final inspections).